Derrick Rose on crutches — a familiar site over the past few years and one the Chicago Bulls will have to get used to again, at as bad a time as there’s ever been. Bernard King. Penny Hardaway. Grant Hill. Brandon Roy. Enjoy your company, Derrick Rose. As it stands now — with news just breaking Tuesday night that Rose will have to have surgery on his right meniscus and his recovery from said surgery will have him out indefinitely — there’s no other place to put him but among the other once-transcendent perimeter or two-way threats who proceeded him both in playing MVP-level ball and at falling steep off that level due to persistent leg injuries. Each man fell so far they never reached their career projections and the franchises that built around each man never recovered their championship dreams with their respective guy at the lead. Check twitter right now and you can see the 140-character eulogies pour in. As it stands now, the Chicago Bulls fan base and follower base can no longer stand, we’re all collectively weak, more than some likely wishing that they could transfer his pain onto themselves so he can wake up tomorrow and no longer face The Return Part III. If only that could be the case. All the reasons are obvious as to why this is the ugliest gut punch to come to a city who’s buzzing with political excitement this evening — for the benefit of our sports-crazy electorate we had winter franchises worth following in the Bulls and Blackhawks (can’t forget the unwanted Patrick Kane news from Tuesday…) and in the Bulls we saw a team as loaded as its ever been in the era of D-Rose. No, the Bulls aren’t perfect this year and yes, Rose isn’t optimal (no less an expert than Penny gave us that obvious piece of analysis late last week) but each element of the team stood a chance to play their best going forward simply because all the elements hadn’t played two dozen games as a complete unit this season. For once, one time since April 2012, injuries looked to have been a thing of the past with the Chicago Bulls and now this happens… and to him … it had to be him. Whether disappointment, anger or melancholy colors your mood right now regarding the Bulls it is now being paired with something else we haven’t necessarily felt before, something only D-Rose could conduct to us via his ever-unreliable knees, something Knick, Magic, Piston and Blazers fans all had to come to grips with at one point when their respective stars took them to the brink of heaven only to let each and every one of them go: hopelessness. Derrick Rose averaged 18.4 points, 5 assists and 3.1 rebounds in 46 games for Bulls this season after returning from previous knee injury. 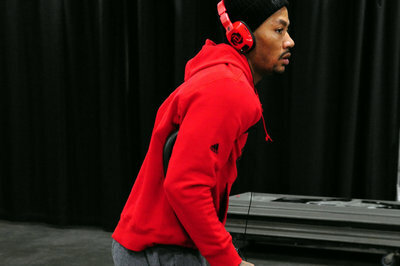 Can't even imagine the mental pain DRose is going through after working so hard to get back. Another huge hurdle to overcome. No person as good at what they do as Derrick Rose is should have the professional misfortune Derrick Rose has had. Source: Initial belief is that this tear is not as extensive as tear in November 2013. So no official timeline until after surgery.